The sun is out in London today (a rare thing indeed) and no rain is forecast (surely even rarer) so I thought I'd get into the mood with this May 1979 half-page House Ad for two of Marvel UK's SUMMER SPECIALS: SPIDER-MAN and MARVEL SUPERHEROES. 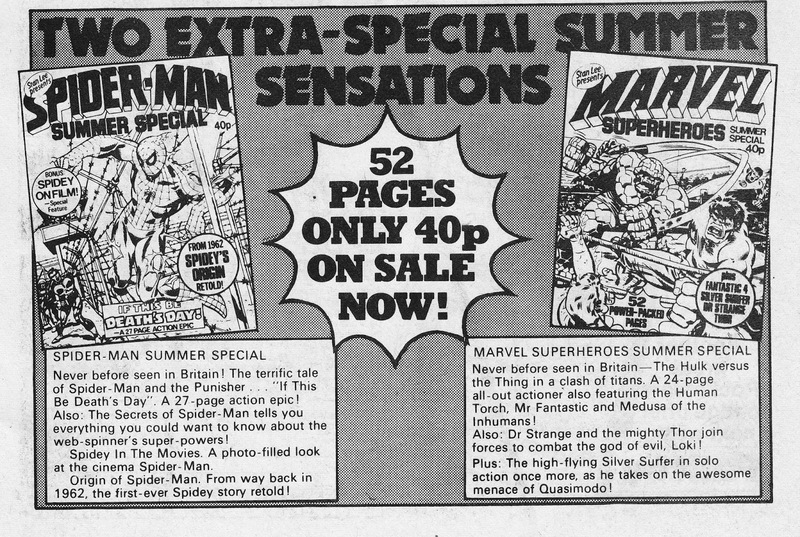 These marked another turning point in the history of the Annex of Ideas: the first time the British operation had published holiday specials. The concept was nothing new to other publishers: they'd been doing it for decades to take advantage of kids with time on their hands (and parents looking for something to keep the brats entertained) during the long school holidays. M-UK hadn't ventured into this territory before partly because the US-controlled operation had little empathy (or - at times - grasp) of the British market and partly because they were busy shipping over copies of the various US one-shots (like the treasury editions and the Super Specials) and regular magazines and saw no need to add more. Dez Skinn's newly semi-autonimous British Bullpen was briefed to expand the British offering and one-shots specials were an obvious way to do that. The Spider-man special was a no-brainer: the web-slinger was, after- all, the most consistent performer in the British portfolio. Marvel Superheroes, on the other hand, was a good example of how Skinn was going to use one-shots as a way of testing new titles and formulas without the risk of launching - and loosing - a regular title. Marvel Superheroes paved the way for the second 1979 relaunch of the former THE MIGHTY WORLD OF MARVEL when the MARVEL COMIC formula proved a bust.